Today we have a beautiful giveaway from a great company - Shucks Pearls. Shucks Pearls is a division of Yonderways, LLC - a small mom and pop owned by career expats Keith and Donna Lyerly (Keith is Clemson alum '80). Keith lives in Shanghai, China where he manages an American manufacturing facility, and because of it he has exclusive access to the pearl markets, as well as pearl farmers and jewelry crafters. Keith and Donna were so impressed with the pearls and their quality, they decided to sell the beautiful jewelry back in the States. Donna, who lives in Hendersonville, NC where the company is located, is the design genius behind the Shucks jewelry line. Keith is a die-hard Tiger fan... even though he has lived out of the country many years, he has kept his same season tickets for 33 years! 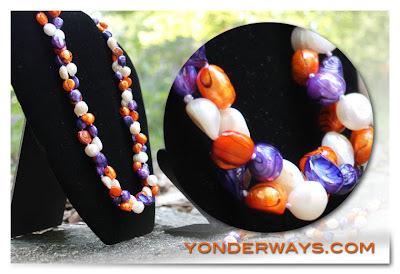 As Clemson fans, Keith and Donna created the Tiger Pearls - freshwater tiger striped pearls in Clemson orange and purple. You can buy the Tiger Pearls as necklaces, bracelets, earrings and more. Shucks Pearls' jewelry is sold online at yonderways.com, in fine stores and through non-profit events called "Pearls for Purpose". The Tiger Pearls can also be purchased at The Tiger Sports Shop and Riverhurst Gifts in Clemson, and Moonstruck Gifts in Mauldin, SC. Shucks Pearls would like to give one very, very lucky Clemson Girl a Tiger Pearls necklace (a $49 value). The necklace is 40″ and comes with a pearl clasp. The pearls are hand strung and individually knotted on silk for durability. The Tiger Pearls can be worn long, doubled and or twisted as shown. 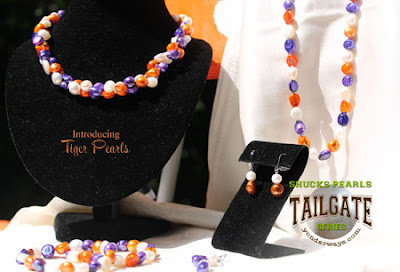 ‘Like’ Shucks Pearls on Facebook, then comment on their page with “Clemson Girls love Tiger Pearls” (1 entry). Deadline for all entries is tonight, Aug. 15th at 7pm EST. We will compile your entries and randomly draw a winner. The winner's name will soon be posted on the blog - the winner has 48 hours after the winner's name is posted to contact us to claim their prize or we will draw a new winner. Special thanks to Donna and Keith and their business, Shucks Pearls, for sponsoring today's giveaway! Left fb Comment on Shucks page. I have shared this on Facebook! but these are the exception! Mallory C. from Greenville, SC... GO TiGERS!!!! Reminds me of a nice version of my husband's phiten necklace. This one I could wear! Love this! Want! Want! Want!